"My favorite customer is the one who calls an appliance repair company and ask what brand of new appliance to buy - Smart! Very smart! We know the worst appliances to buy and we know the best appliance to buy because we service them daily - though we don't profit off that customer at that point and time - our conversation with that customer creates a customer for life!" Police Officer Fred McGilberry should have been a cook because the barbeque I tasted at the Galveston county cook off was amazing, mesmerizing and just all around absolutely delicious! Cook Family Appliance Fixed For Free! 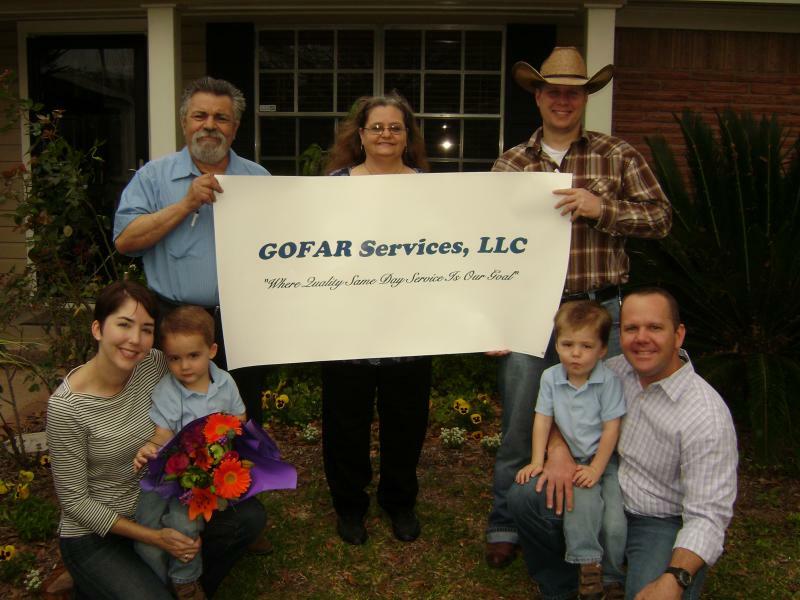 The Cook family seen below was GOFAR Services, LLC 1000th customer since the company incorporated back in July of 2011. Matthew Cook (seen below, bottom right) called in early Monday morning (March 5th) and made an appointment to have their clothes dryer serviced. A few minutes later the family was notified that since they were the 1000th customer their clothes dryer would be fixed for free. The Cook family also received gift cards to local dining establishments. 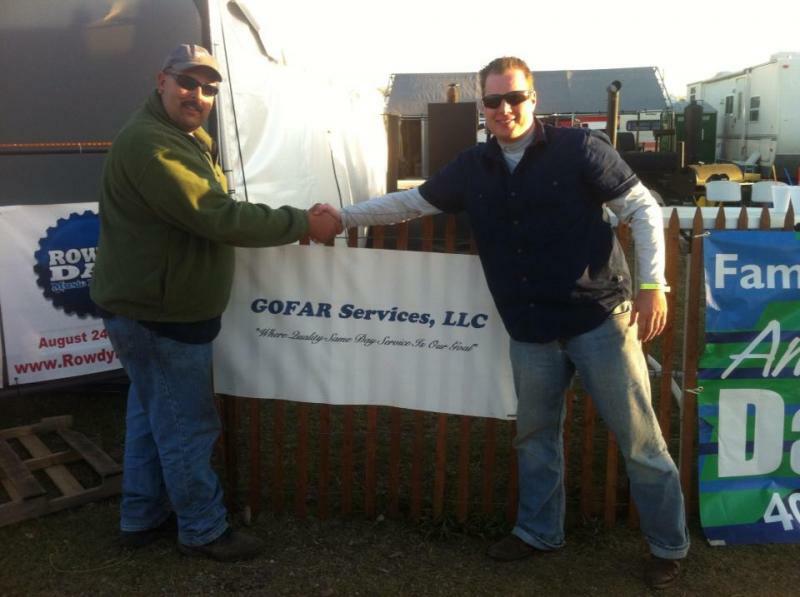 GOFAR Services, LLC would like to thank all the customers who have had their appliances serviced through us. We know there are many companies to choose from and though we cannot fix every appliance for free we try our very best to service appliances same day, at low cost and on time. In picture: Holding sign: Joe Accavallo, Rhonda deArmas, Brian Gillespie. Cook Family: Heather Cook, Christian Cook, Charles Cook, Matthew Cook. Las Vegas - Premium majap brand Thermador will introduce a full-surface induction cooktop at 2012 International CES. Like all induction models, the company's Freedom cooktop uses electromagnetic induction to heat metal cookware without conventional burners, leaving the cooking surface cool to the touch. However, the new appliance is the first to feature a natural-mapping user interface that intelligently recognizes cookware size, shape and position to deliver heat anywhere and in any shape across the cooktop surface, Thermador said. Freedom also features a 6.5-inch, full-color touchscreen display that shows the position of all cookware on the cooking surface, controls power setting and cooking time, and performs live updates as cookware is moved to a different position. A division of BSH Home Appliances, the manufacturer will hold the first public demonstration of its cooktop here at CES Unveiled: The Official Press Event of the International CES this Sunday at The Venetian hotel, beginning at 4:00 p.m.
"Induction is perhaps the most revolutionary cooking technology," said Zach Elkin, Thermador's director of brand marketing. "Thermador takes induction cooking to the next le vel by answering two questions with the new Freedom induction cooktop: What if you could place cookware anywhere on the cooktop? And, what if you can use cookware of any size and shape on the cooktop?" To that end, the new cooktop, for which BSH holds 30 international patents, allows home chefs to place specially-shaped cookware such as griddles and oval pans anywhere on the cooking surface. The natural-mapping user interface also enables them to move their cookware around during the cooking process, which is especially helpful as different dishes are added and removed during meal preparation. The absence of predefined cooking elements adds 63 percent more cooking area to the surface, providing what Thermador described as the largest cooking surface in the industry. The surface is powered by 48 individual 3-inch induction heating elements which output from 15 Watts to 4,600 Watts. Freedom is expected to hit dealer floors this July with a manufacturer's suggested retail price of $4,949. Increasingly, U.S. appliance buyers choose the appliance brand they want first – then choose a retailer that carries their brand of choice. New studies from J.D. Power and Associates – the 2011 Laundry Appliance Satisfaction Study and J.D. Power and Associates 2011 Kitchen Appliance Satisfaction Study – rank the brands that give customers the most satisfaction, as well as reveal new trends in appliance buying behavior. Increasingly appliance buyers choose the appliance brand they want first – then choose a retailer carrying that brand, according to the J.D. Power and Associates 2011 Laundry Appliance Satisfaction Study and the J.D. Power and Associates 2011 Kitchen Appliance Satisfaction Study. J.D. Power reported that the extent of this shift in shopping behavior varies slightly by appliance type. The largest increase was seen among owners of ranges, cooktops, and ovens, with about 44% of these owners in 2011 saying they selected their appliance brand first. This measure is up 6% from 2010. The smallest increases occur in clothes dryers and refrigerators, up 4% each from 2010. "The wide array of product information available, particularly from online sources, makes it easier than ever for appliance shoppers to do research prior to making a purchase," said Jim Howland, senior director of the real estate and construction industries practice at J.D. Power and Associates. “Online ratings, for example, are becoming increasingly influential among many appliance shoppers." The reports also found that those who do the online research and choose their brand before choosing a retailer end up much more satisfied with their appliance than owners who don’t. The owners who say they did their research before visiting a retailer had satisfaction averages that were 20-34 points higher on a 1,000-point scale. Satisfaction among owners who select the appliance brand before visiting a retailer averaged 14-29 points higher than satisfaction among owners who selected the retailer first, then chose a brand carried by the retailer. Despite the changes in shopping behavior, traditional sources of shopping information – such as the owner’s past experience with a brand, in-store product displays, and recommendations from salespersons - continue to be very influential. The J.D. Power and Associates 2011 Appliance Mystery Shopping Report showed that many of the appliance brands that receive high overall satisfaction scores also receive particularly strong recommendations from salespeople. The recommendations can significantly impact brand choice and market share, especially when the salespersons offer compelling reasons for the recommendation. Samsung – for the third year in a row - ranked highest in satisfying clothes washer owners. Samsung's score was 834 and did especially well in ease of use, styling and appearance, and price. LG ranked second with a score of 827 and scored especially well in the warranty factor. Kenmore Elite ranked third with a score of 825 and scored well in the features factor. The industry average score for clothes washers was 783. Samsung also ranked highest in customer satisfaction with clothes dryers – the fourth year it was in the top spot. Samsung scored 830 and did particularly well in four of the six factors: ease of use, styling and appearance, features, and price. Whirlpool Duet scored 829 and LG scored 823. Mystery shoppers reported that LG, Samsung, and Whirlpool washers and dryers are recommended most often by salespersons at major U.S. appliance retailers. The industry average score for clothes dryers was the same as washers: 783. Sub-Zero scored 834 and ranked highest in terms of satisfying refrigerator owners. Sub-Zero did especially well in five of the six factors: ease of use, performance and reliability, styling and appearance, features, and warranty. Samsung ranked second with a score of 820. LG ranked third with a score of 790. Mystery shoppers reported that Samsung receives particularly high recommendation rates from major appliance salespeople. The industry average score for refrigerators was 759. Miele scored 814 and was the top-ranked brand in customer satisfaction with dishwashers for a second year in a row. Miele performed particularly well in performance and reliability and warranty. Fisher & Paykel scored 805 to claim the second spot. Kenmore Elite was third with a score of 802. Mystery shoppers said Kenmore dishwashers receive notably high rates of recommendations from salespeople. The industry average score for dishwashers was 760. LG and Wolf share top cooking appliance ranking, tying in points at 804 each. This is the second year in a row at the top spot for Wolf. GE Monogram was the next-highest ranked cooking appliance brand with a score of 801. Mystery shoppers said appliance salespeople provide high rates of recommendations for GE ranges. The industry average score for cooking appliances was 774. Name of Product: Whirlpool brand single-door frost-free freezers (20 cubic feet or less) and refrigerators (17 cubic feet). Hazard: In some units the end cap of the defrost heater tube can dislodge, resulting in a potential shock hazard and may melt, deform and/or burn the interior food liner. Incidents/Injuries: No injuries have been reported, however this recall is being conducted to ensure your safety. Want to Post Your Own Appliance article here? If you are interested in providing your own article you must first contact administrator at email address listed below. Please provide article in email and you will be notified of whether or not your article will be posted on our website. Please have article relevant to "appliances" or "appliance repair". 09/23/2011 - The Houston located appliance repair company GOFAR Services, LLC that specializes in all types of refrigerator and appliance repairs in and around the Houston area has plans in the near future to have their own line of water filters that are said by CEO Brian Gillespie to provide superior﻿ filtration compared to all other brands and types of water filtration devices on the market. Walter filters are used on just about every refrigerator and ice machine out on the market today. These water filters are said to be in the development stage and include some "secret" techniques to filtration not used by any other manufacture﻿. 713-681-4343 for appliance repair including refrigerators, washers, dryers, ovens, stoves, ranges, ice makers, ice machines and more!